As interns at Environmental Defense Fund (EDF), we’ve been tapped as resident experts on surviving on college budgets, social media, and all things Millennial. Research tells us Millennials are the largest living generation. So, as Clean Energy interns this summer, we’ve learned that gives us much power to change the game for the energy sector. But in unexpected ways. As young people, we’re working at EDF because we want to promote systemic, market-based solutions and new technologies that shift our country toward clean energy and away from our fossil fuel past (did someone say solar paint?). We have high standards for our energy future, and our priorities differ from our parents’ (for example, millennials tend to value careers [PDF] over religious life). And although we’re the thriftiest generation, 64 percent of us are actually willing to pay more on our electric bill if it’s generated by clean energy. A generation that has been slow to invest, millennials are now buying stocks in companies that further the clean energy economy. Among millennials’ favorite stocks are companies like Apple and Facebook who declared their commitment to rely on 100 percent renewable energy through RE100. Others include Amazon, which launched four wind and solar farms in 2016 and publicly supported the Clean Power Plan; Tesla, which started selling solar panels this year; and Nvidia, which plans to reduce emissions by 15 percent per employee by 2020 and only operates in buildings that comply with LEED standards. We like to put our money where our values are. Our generation is the most likely to pay more for responsibly made products and roughly 80 percent of us want to work for companies that care about their impacts. Nearly 400,000 millennials are currently working in green jobs. For a variety of economic and social factors, our lifestyles tend to be more energy efficient. Many of us are choosing buses and bikes over cars. And we’re more likely to purchase new, energy-saving products and services like Nest learning thermostats than people over 55, according to research by Accenture. “Energy providers must take these and other insights about these groups to heart, to unlock value, because consumers’ preferences and behaviors are rapidly changing the market landscape,” said Tony Masella, managing director of Accenture Energy Consumer Services. Appeal to our drive for progress and prosperity based on clean, equitable energy solutions. Students from hundreds of colleges and universities have led successful movements urging their administrative leaders to divest from fossil fuels. Educational institutions make up 14 percent of the approximate $5.42 trillion value of institutions around the world that have divested from the fossil fuel industry. 600 colleges and universities are already members of the Climate Leadership Network, a network of institutions committed to action plans to achieve carbon-neutrality in the coming future. But, for some students, these commitments mean nothing if their schools are still buying stock in fossil fuels, even if the financial impact to the industry is slim. In order to thrive, today’s energy sector should engage its youngest customers – which happen to be America’s most tech-savvy, environmentally conscious generation. Attempts to garner support for fossil fuel would be like Sony trying to sell us Walkmans –futile. Appeal to our drive for progress and prosperity based on clean, equitable energy solutions. More and more, we are the ones making important energy decisions –as building managers, homeowners, engineers, utility regulators, and, one day, the next head of the Department of Energy. This entry was posted in Clean Energy, Energy Efficiency, Energy Equity, Energy Financing, Energy Innovation, General, Grid Modernization. Bookmark the permalink. Both comments and trackbacks are currently closed. Great post! As an intern at a renewable energy company this summer, I am excited but nervous about the future of the industry. 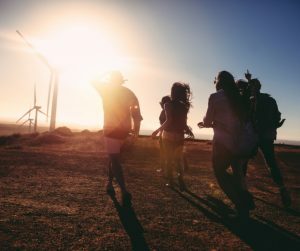 Millennials are an invaluable component in the drive towards achieving a clean energy economy; it’s time to prove our worth and continue to make this happen. We need to divest from carbon based fuels. The emphasis on fossil fuels has meant an increase in wood burning in homes and for power generation in keeping with the bizarre belief that burning wood is greenhouse neutral. Refugees/immigrants/illegals are mainly from warm, low energy consuming countries moving into our colder and, of necessity, a high energy consuming country and the numbers are so large that it is difficult to see how the efforts of individuals such as buying energy efficient appliances will offset increases in greenhouse emissions simply because of increased numbers. As intern millenials you don’t even have the opportunity to make bad decisions, you have no money of your own making. I remember applying for an EDF non-paid internship with an undergraduate degree in environmental policy and economics and losing out to someone with a graduate degree in policy. Millennials need the opportunity to actually participate in society instead of be held back bay our parents generation who won’t let go of control, ensuring that government policy reflects the needs of their end-of-life instead of the needs of the next generation. Also, who can take un-paid internships after an expensive college? Privileged people. Me included. I used to not own a car, until I injured both my knees. I used to say my carbon foot print was tiny until I had a family. I used to live cheaply until I wanted to own a home and prepare for my retirement. Yes, I still live an environmental life to the extent that I can as a millenial stuck in a society built by the last generation. Let’s stop favoring the privileged people, stop expecting college graduates to work for free, and stop accepting the incrementalism that EDF has accepted in a time of drastic environmental need. We are no longer in the era of prevention when it comes to environmental degradation, its time for mitigation and adaption. There is no saving something that is already gone. Appliances with a slight more efficiency are cute, but we need much more bold action than that. Start paying interns respectfully, stop taking advantage of millennial labor. Money is power and control, and by withholding from most of us (and highly rewarding a few of us) that is how they are disempowering our generation and ensuring all the conflict and distraction of income disparity. Anders – Thank you for your feedback. We agree that this is a time where there is a need to hire the best and brightest to fight for our environment and protect our future. For the past two years, EDF has maintained a formal policy that we only hire paid interns or interns that are receiving academic credit from their institution. This decision was made in order to reach all valuable candidates, including those that are not able to accommodate an unpaid role. EDF remains committed to finding solutions to some of the greatest problems facing our world today, which is only made possible by our impressive staff members. We hope that you will keep us in mind for future roles. I am looking for renewable energy content. I have a topic about energy next week. It’s nice to have been here.